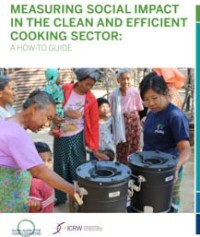 The Alliance, in collaboration with the International Center for Research on Women (ICRW), has created a set of indicators, methodologies, and tools for measuring the diverse social and economic impacts of clean and efficient cookstoves and fuels initiatives. For users of clean and efficient cookstoves and fuels, the social and economic impacts may include reductions in the amount of time required for collecting fuel or cooking, household expenditures on fuel, and exposure to safety and health risks. For those engaged throughout the value chain, the social impacts may include increases in access to financial services, income and stable employment, and access to networks and training. The Social Impact Measurement System provides the foundation for organizations, investors, and donors to be on the same page regarding the definition, measurement, analysis, and reporting of social impacts related to clean and efficient cookstoves and fuels.